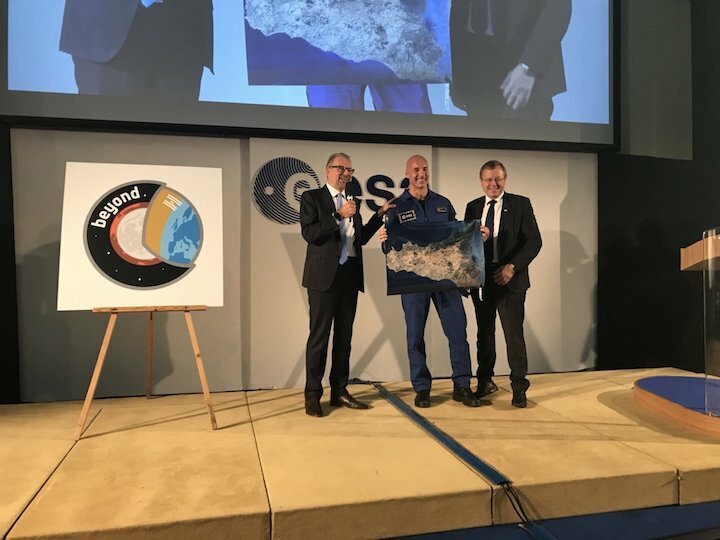 Today ESA astronaut Luca Parmitano announced the name of his second mission and logo during an event at ESA’s ESRIN establishment in Italy. Luca will be going ‘Beyond’ when he returns to the International Space Station in 2019 as part of Expedition 60/61, alongside Andrew Morgan of NASA and Alexander Skvortsov of Roscosmos. In selecting Beyond, Luca was inspired by his fellow ESA astronauts. From the nearness to Earth of Thomas Pesquet’s Proxima mission to the broadening scope of Alexander Gerst’s current Horizons mission, Luca saw a path that will push humankind even farther, for the benefit of all. The mission logo illustrates this trajectory. An astronaut looks out into space through a helmet visor. Earth and the Space International Station are reflected in this visor. In the distance, the Moon is poised for humankind’s return, with the Orion spacecraft and exploratory rovers. Beyond is Mars, the Red Planet, currently being studied by satellites such as ExoMars, Mars Express and, one day, by humans. The research Luca will be running on the Space Station will contribute to keeping humans safe on longer exploration missions. Also on the agenda for Luca are demonstrations that will develop the technological and operational knowledge that will allow humans, together with robots, to explore the Moon and Mars from orbit and on their surfaces. It is not all experiments for Luca. He will serve as Space Station commander during the second half of his mission. This is the third time a European astronaut has held this leadership role, but the first by an Italian astronaut. Luca is currently training for his upcoming mission at NASA’s Johnson Space Center in Houston, at Star City near Moscow, and at the European Astronaut Centre in Cologne. In addition to running simulations on the Soyuz spacecraft he is also familiarising himself with the experiments he will conduct in the orbital outpost. Luca is excited to return to Europe’s Columbus laboratory, launched 10 years ago this year. Columbus houses as many disciplines as possible in a small volume, from astrobiology to microbiology through metallurgy and psychology. Countless papers have been published drawing conclusions from experiments performed in Columbus, and Luca will continue the research during his mission. Follow Luca as he prepares for Beyond via lucaparmitano.esa.int.